Taking Note: Saturday night in the WHL . . .
Saturday night in the WHL . . .
What follows is a quick look at Saturday’s happenings on the ice in the WHL. 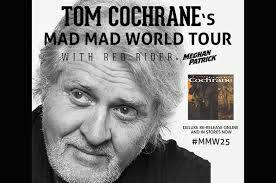 As I posted here in the wee hours of Sunday morning, I was at the Kamloops stop for Tom Cochrane’s Mad Mad World Tour on Saturday night. Yes, it was louder than at any Blazers’ game this season. The show’s highlight? Well, we were in the third row from the front. A woman seated directly in front of us got up to dance during the show’s second half and somehow ended up on the stage. She and her male companion were last seen being escorted from the building. Seriously, it was quite a show. Cochrane proved that he really is Canada’s Bruce Springsteen. At the age of 63, Cochrane still brings it. The tour, which also features Red Rider, is in Prince George on Monday night. At Everett, the Silvertips scored three times in the game’s first eight minutes en route to a 4-2 victory over the Seattle Thunderbirds. . . . Everett scored three times on its first six shots, forcing Seattle to replace starting G Rylan Toth, who is having a banner season, with Carl Stankowski, who stopped 33 of 34 shots in 51:25. . . . G Carter Hart blocked 15 shots for Everett. . . . Seattle remains with D Ethan Bear, F Scott Eansor and D Jarret Tyszka. . . . Everett D Kevin Davis had two assists, the first of which was his 100th career point. He is quietly having a giant offensive season, with six goals and 45 assists in 64 games. Previously, he had three goals in each of the past two seasons. In 2014-15, he had career highs in assists (22) and points (25). . . . The victory allowed Everett (39-14-11) to move back into first place in the U.S. Division, one point ahead of Seattle (41-19-6). . . . Everett has eight games remaining, two more than Seattle. . . . Announced attendance: 8,249. At Kelowna, the Rockets erased a 2-0 first-period deficit and beat the Tri-City Americans, 4-2. . . . F Dillon Dube scored twice for Kelowna, giving him 15, while F Reid Gardiner scored his 14th goal as he ran his point streak to 12 games. Since joining the Rockets, he has 30 points in 22 games. . . . Cal Foote of the Rockets and Tri-City’s Juuso Valimaki, two of the WHL’s top defencemen, each had two assists. . . . The Rockets (40-21-5) have won four in a row and now are second in the B.C. Division, four points behind Prince George and three ahead of Kamloops. . . . Kelowna has six games remaining, one more than those two teams. . . . The Americans (38-25-3) are third in the U.S. Division, five points ahead of Portland, which has a game in hand. . . . Announced attendance: 5,521. At Moose Jaw, the Warriors scored the game’s last three goals, all in the second-half of the third period, and beat the Medicine Hat Tigers, 5-3. . . . F John Dahlstrom, who has 27 goals, gave the Tigers a 3-2 lead with a goal at 10:34 of the second period. . . . The Warriors, who had led 2-0, won it on goals from F Noah Gregor (22), F Tanner Jeannot (18) and F Thomas Foster (20), who scored twice. . . . F Brayden Burke had two assists for the winners. . . . Moose Jaw (40-17-8) is comfortably in second place in the East Division. It has won eight straight games and is six points behind Regina and 12 ahead of Swift Current. . . . The Tigers (46-19-1) had won their previous four games. They are second in the overall standings, three points behind Regina, which holds two games in hand. Medicine Hat leads the Central Division by two points over Lethbridge, with each team having six games remaining. . . . Announced attendance: 3,458. At Portland, G Cole Kehler stopped 12 shots to record the shutout as the Winterhawks beat the Vancouver Giants, 3-0, to sweep their tripleheader. . . . Kehler has two shutouts this season, the first two of his career. . . . Vancouver was outshot 11-1 in the first period and 12-3 in the third. . . . The Giants went 0-6 in its two tripleheaders, losing three to the Victoria Royals before dropping three straight with Portland. . . . F Keegan Iverson had two assists, and has four goals and four assists over his past five games. . . . Each of the Winterhawks’ scorers — F Cody Glass, F Joachim Blichfeld and F Ryan Hughes — now has 27 goals. . . . Portland (35-26-4) holds down the Western Conference’s second wild-card spot, five points behind Victoria, and is fourth in the U.S. Division, five points behind Tri-City. . . . Vancouver (19-41-6) will miss the playoffs. . . . Announced attendance: 5,903. At Prince Albert, F Parker Kelly and F Cavin Leth each had four points and G Ian Scott earned the shutout as the Raiders beat the Kootenay Ice, 8-0. . . . The Ice had lost 4-0 in Saskatoon on Friday night. . . . Kelly scored twice, the second one on a penalty shot, and added two assists. He’s got 16 goals. . . . Leth had a goal, shorthanded, and two assists. He has 22 goals. . . . Scott stopped 25 shots in putting up his second shutout of the season and third of his career. . . . Neither of these teams will be in the playoffs. . . . The Raiders (18-41-7) are 21st in the overall standings, five points ahead of the Ice (14-40-10). . . . Announced attendance: 2,177. At Prince George, F Jansen Harkins became the franchise’s all-time scoring leader in a 6-1 victory over the Kamloops Blazers. . . . Harkins had a goal and three assists, as he ran his career points total to 240 in 270 regular-season games. That broke the record that had been held by F Chase Witala (2011-16), who had 239 points in 302 games. Harkins tied the record with his 20th goal of the season and broke it with an assist on a third-period PP. . . . Prince George got big nights from the McTwins, too, with F Colby McAuley scoring twice and adding two assists, while F Kody McDonald had a goal and two helpers. . . . Cougars F Jesse Gabrielle scored his 30th goal, the second season in a row that he has reached that mark. . . . The Cougars had a season-high 57 shots on goal just one night after unleashing 50 shots in an 8-4 victory over the visiting Blazers. The home side scored five second-period goals in each game. . . . Prince George put 11 pucks behind Blazers G Connor Ingram in 91:07 over the two nights. . . . Kamloops (38-23-6) went into the weekend in second place in the B.C. Division, three points behind the Cougars (42-20-5). The Blazers headed home in third place, seven points behind Prince George and three behind the second-place Kelowna Rockets. . . . Announced attendance: 3,969. At Red Deer, the Swift Current Broncos clinched a playoff spot with a 2-1 OT victory over the Red Deer Rebels. . . . Swift Current won the season series, 4-0, with three of the victories coming in extra time. . . . F Aleksi Heponiemi’s 25th goal pulled the Broncos into a tie at 17:18 of the third period. The Finnish freshman then drew the primary assist on F Tyler Steenbergen’s 46th goal, the winner, 52 seconds into OT. . . . The Broncos (33-20-10) are headed to a third-place finish and a first-round clash with Moose Jaw in the East Division. . . . The Rebels (26-28-11) are third in the Central Division, only three points ahead of Calgary. . . . Announced attendance: 4,926. At Regina, the Calgary Hitmen added to the league-leading Pats’ woes by hanging a 6-3 loss on them. . . . F Beck Malenstyn and F Luke Coleman each had a goal and two assists for Calgary, which took a 4-1 lead into the second period. . . . Calgary held a 16-9 edge in shots in the first period. . . . F Matteo Gennaro scored his 39th goal, shorthanded, for Calgary. . . . Malenstyn has 25 goals; Coleman has 14. . . . Regina got two goals from Adam Brooks, who has 35. . . . Calgary G Kyle Dumba was terrific, with 32 saves, 14 of them in the third period. . . . Regina had F Filip Ahl and D Jonathan Smart back from injuries, but F Duncan Pierce (ankle) left in the second period. . . . The Hitmen (25-20-10), who had lost three straight, hold the Eastern Conference’s second wild-card spot, one point ahead of Saskatoon. . . . The Pats (44-12-8) have lost four in a row (0-3-1) for the first time this season. They lead the overall standings by three points over Medicine Hat with two games in hand. . . . Announced attendance: 5,546. At Saskatoon, the Lethbridge Hurricanes erased a 4-2 deficit to beat the Blades, 5-4 in OT. . . . D Brennan Menell’s 12th goal, at 0:54 of OT, won it. . . . F Giorgio Estephan, who had the lone assist on the winner, was in on the last three goals. He had the primary assist on F Zak Zborosky’s 41st goal, at 1:47 of the third period, then tied the score with No. 30, at 11:13. . . . Earlier, Estephan had scored his 29th goal. . . . Lethbridge F Tyler Wong had three assists, becoming the WHL’s third 100-point man this season. He's now at 101. . . . The Blades got three goals from F Braylon Shmyr, who has 32. . . . The Hurricanes (42-17-7) have won six straight and now are two points behind Central Division-leading Medicine Hat. . . . The Blades (25-31-9) have points in two straight (1-0-1) and are one point out of a playoff spot. . . . Announced attendance: 4,413. At Victoria, the Royals clinched a playoff spot with a 4-3 OT victory over the Spokane Chiefs. . . . F Matt Phillips scored the winner at 2:42 of extra time. . . . He had two goals, giving him 46, and an assist. Phillips tied the Royals’ single-season record for goals that had been set last season by F Tyler Soy, who remains sidelined with an undisclosed injury. The franchise record (51) is held by F Ryan Howse (Chilliwack Bruins, 2010-11). . . . F Hudson Elynuik scored two PP goals for Spokane. He’s got 25 goals. . . . The Royals (37-23-5) have points in seven straight (6-0-1). They are fourth in the B.C. Division, three points behind Kamloops. Victoria plays its next five games on the road, including two in Kamloops and two in Kelowna. . . . The Chiefs (26-29-9) are 12 points away from a playoff spot with eight games to play. . . . Announced attendance: 6,059. Regina at Brandon, 4 p.m.
Kootenay at Moose Jaw, 4 p.m.